This work follows up on observations made in 2012 (Maehara et al. Nature on 2012 May 24), where the team reported finding several hundred superflares on solar-type stars by analyzing stellar observation data from Kepler Space Telescope. This discovery was very important since it enabled the astronomers to conduct statistical analysis of superflares for the first time. However, more detailed observations were needed to investigate detailed properties of superflare stars and whether such massive flares can occur on ordinary single stars similar to our Sun. More than half the observed 50 stars show no evidence of binarity (that is, they are not binary stars). The team confirmed the characteristics of the target stars as similar to those of the Sun. On the basis of the Kepler data, superflare stars show somewhat regular, periodic changes in their brightnesses. The typical periods range from one day to a few tens of days. Such variations are explained by the rotation of the star and its starspots. As shown in Figure 1, the stars seem to become dimmer when their starspots are on their visible sides. Moreover, the timescales of the brightness variations should correspond to the stars' rotation speeds. Spectroscopic observations allow observers to estimate the rotation velocity from the broadening of absorption lines (Figure 2), and confirm that a velocity derived from spectroscopic data matches the brightness variation timescale as the star rotates. In addition, the measured rotation velocity of some target superflare stars is as slow as that of the Sun. Based on solar observations, astronomers know that if there are large dark star spots on a stellar surface, the "core depth" (the depth and width of a spectral line) of the Ca II 854.2[nm] (ionized Calcium) absorption line becomes shallow. 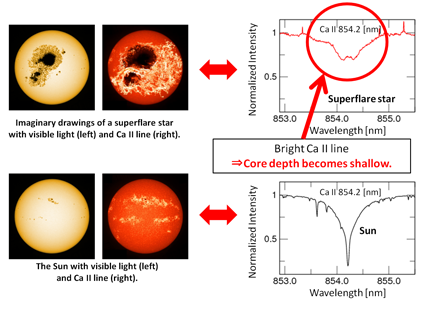 Using this, they investigated the core depth of Ca II 854.2 [nm] line, and found that superflare stars have large starspots compared to sunspots (Figure 3). 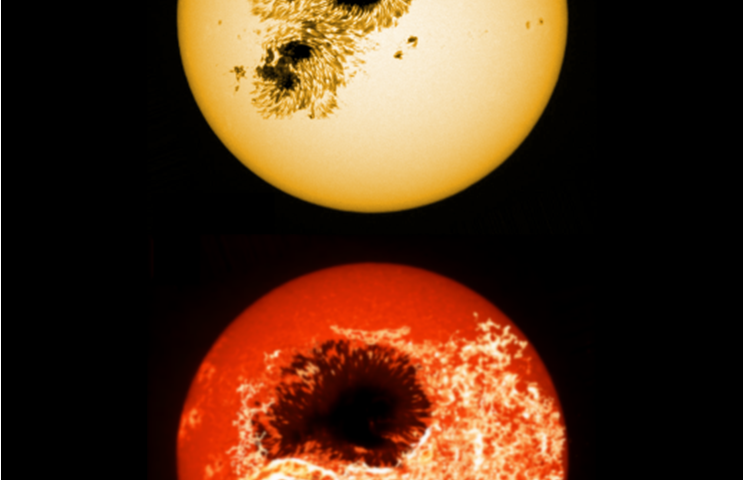 The results of these observations and analysis confirm that stars similar to the Sun can have superflares if they have large starspots. In the future, in addition to the continuing spectroscopic observations with Subaru Telescope, the team will conduct observations with the Kyoto University's Okayama 3.8m telescope, which is now under construction. This will allow them to investigate more detailed properties and changes in long-term activity of superflare stars. More information: This research is based on the following two research papers. Paper 1: "High Dispersion Spectroscopy of Solar-type Superflare Stars. I. Temperature, Surface Gravity, Metallicity, and v sin i"
Paper 2: "High Dispersion Spectroscopy of Solar-type Superflare Stars. II. Stellar Rotation, Starspots, and Chromospheric Activities"
If these stars have gas giants that have been moving and throwing off the equilibrium of countless objects, the in-falling material could be plasmized and causing the flares we see.